Perioperative medicine - the care of patients considering, preparing for, having and recovering from surgery is an emerging and collaborative speciality. We have developed our innovative and exciting Certificate, Diploma and MSc to offer a unique distance learning experience at University College London. 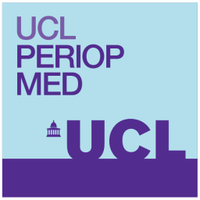 With our faculty made up from the leading lights at UCL, other major UK institutions and wider afield, the Certificate, Diploma or MSc in Perioperative Medicine will help you develop skills that you can take back to the bedside and clinic to improve the care of high risk surgical patients. The diploma in Perioperative Medicine comprises the certificate (modules 1-4) and modules 5-8. Once the first 8 Modules have been passed, a MSc in Perioperative Medicine is awarded on successful completion of your thesis. The programme is totally delivered through distance e-learning. We use a wide range of learning styles within the programme including vodcasts, podcasts, written text, online seminars, case reviews and graphics. Have a look at the video below where the faculty tutor Dr Rob Stephens describes the structure and guides you around one of the chapters in detail.